Caution - InfiniBand cables must never turn tighter than a 5-inch (127 mm) radius. A tighter radius damages the wires and fibers inside the cable. 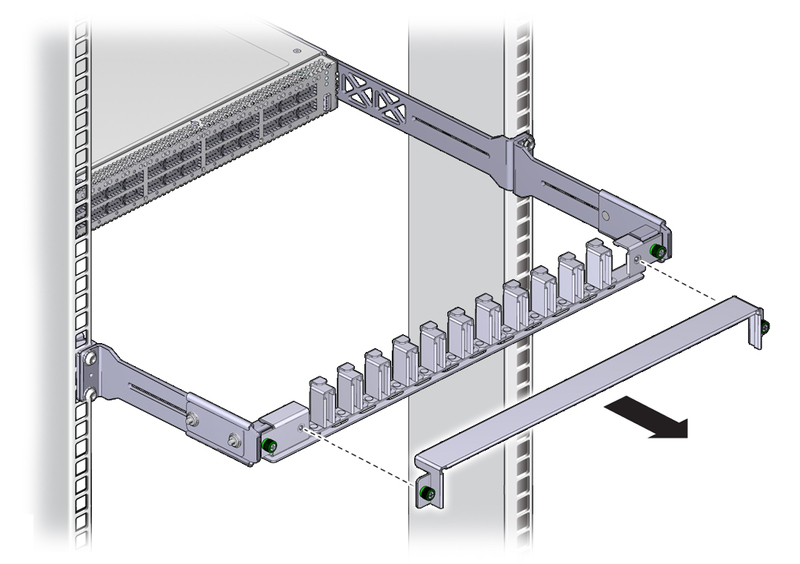 Note - When you install the InfiniBand cables, connect cables to the lower connectors first. Then connect cables to the upper connectors. Loosen the two captive thumbscrews that secure the cover to the cable management bracket. Remove the protective cap from the connector and visually inspect the cable connector. The shell should not be bent and should be parallel to the inner boards. If the connector is bent or damaged, use a different cable. Ensure that the retraction strap is folded back against the cable. Orient the cable connector to the QSFP receptacle squarely and horizontally. Ensure that the L groove is up for the top row of receptacles, or that the L groove is down for the bottom row of receptacles. Note - On some QSFP cable connectors, there is a retraction strap. Both the retraction strap and L groove indicate the reference surface for the connector. When installing QSFP cables in the top row of receptacles (0A, 1A, 2A, and so on), ensure that the L groove and retraction strap are up. 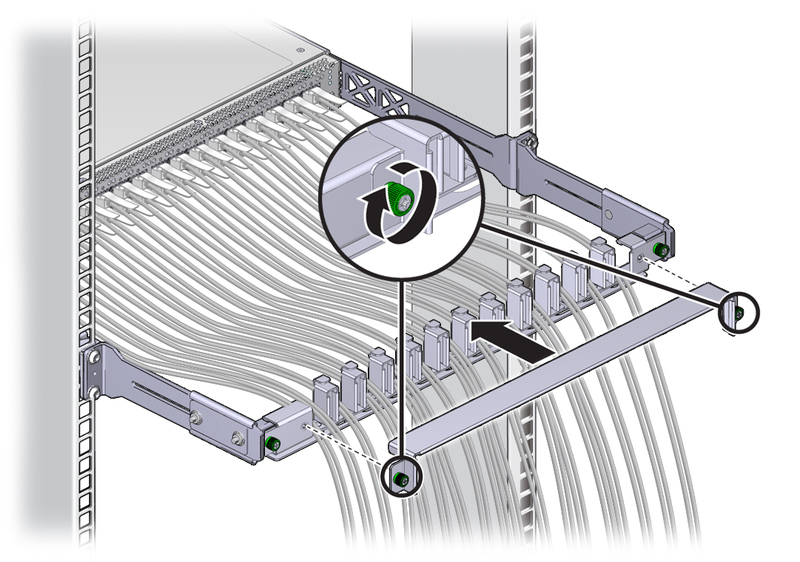 When installing QSFP cables in the bottom row of receptacles (0B, 1B, 2B, and so on), ensure that the L groove and retraction strap are down. See Identify the InfiniBand Cable. Slowly move the connector in. 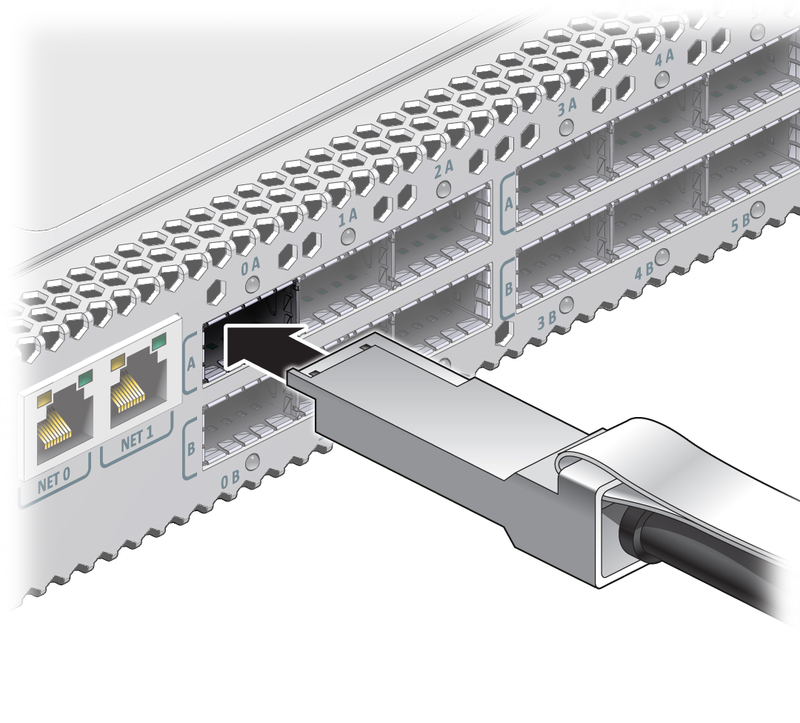 As you slide the connector in, the shell should be in the center of the QSFP receptacle. If the connector stops or binds after about 1/4 in. (5 mm) travel, back out and repeat from Step 6. If the connector stops or binds with about 1/8 in. (2 mm) still to go, back out and repeat Step 7. Continue to push the connector in until you feel a detent. 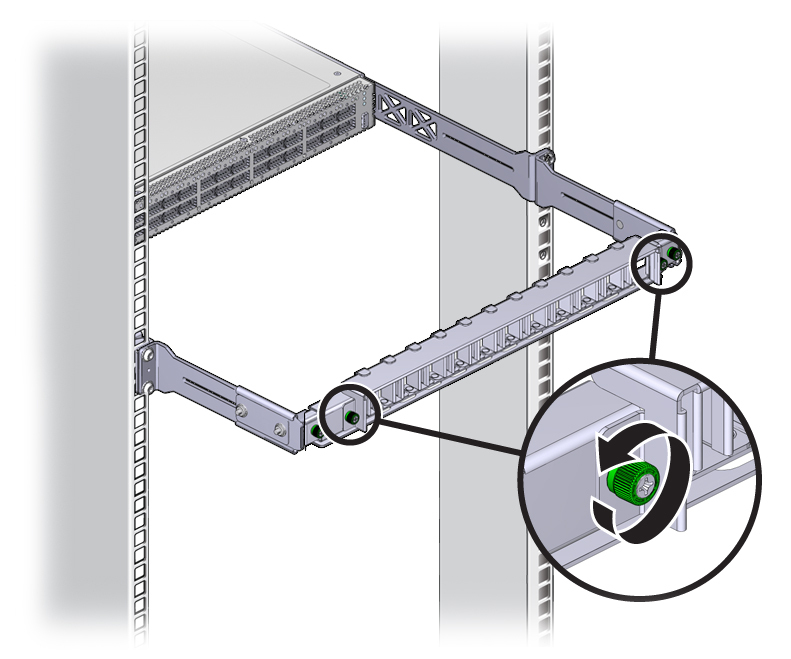 Place the cable into the open slot on the cable management bracket. Repeat Step 4 through Step 9 for all cables to be installed. Replace the cover for the cable management bracket and tighten the thumbscrews. 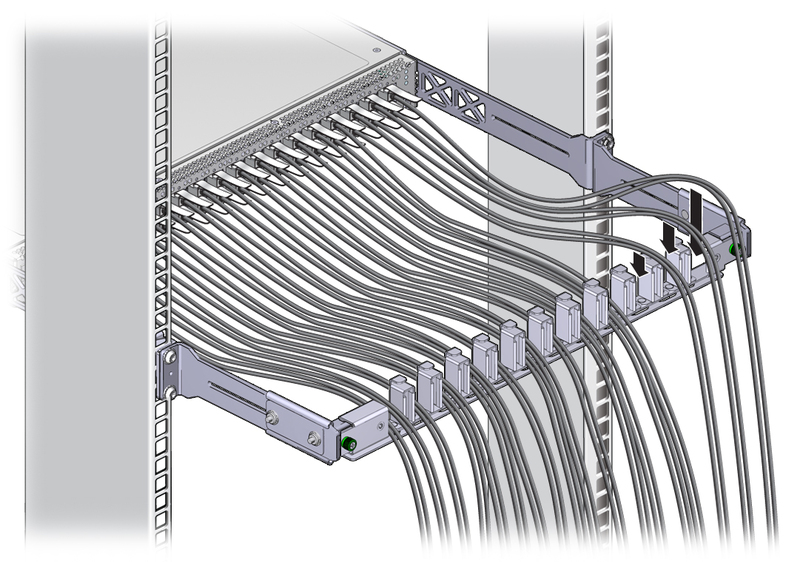 Route the InfiniBand cables so that they do not interfere with other cables, or with servicing the switch or other systems. Use hook and loop fastener straps to bundle and secure the cables. Note - Do not use cable zip ties to bundle or secure the cable, because the ties damage the fibers inside the cable. Check that the Link LEDs for cabled links are lit green. If the Link LED is unlit, the link is down. If the Link LED flashes, there are symbol errors. See Check Link Status LEDs. If possible, close the rack doors to maintain EMI compliance.